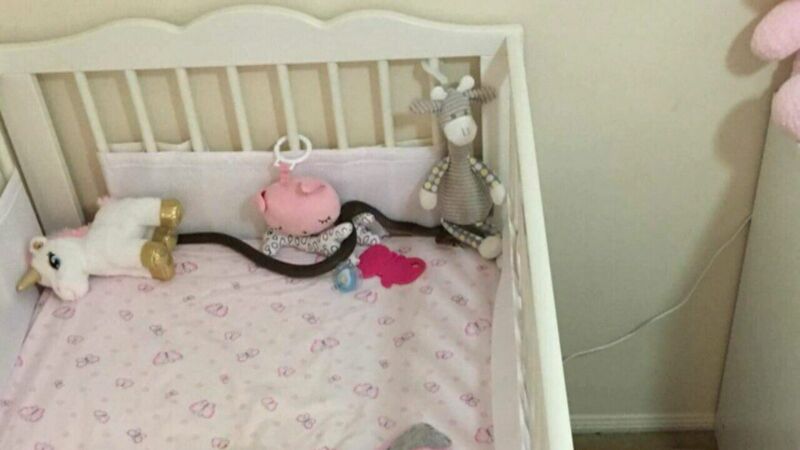 In the sort of horror story you have to see to believe, a Queensland mum has photographed a deadly brown snake in her daughter’s cot … on the nursery floor … under her baby’s cot and generally larking about having a jolly old time. Dear. God. No. Gulp. A terrified Aleisha says she was petrified and that the snake was surprisingly active and making himself at home. As the weather warms up across the country, all kinds of frisky critters are seeking mates, and it seems they’re prepared to look for love in all the wrong places. Like under unicorns and giraffes and blankies. Oh JESUS. Keen to capture some shots of the snake to prove she was not hallucinating some sort of end of days scenario, the freaked-out mum said the whole nightmare was a bit of a blur. “I’m trying to reach for my phone and stop my son from trying to go see the snake … It was very scary,” Aleisha said. The now-relieved mum said she was so glad her daughter was unsettled, prompting her to take her out of the cot just one hour before this snake’s sneaky, surprise visit. She’s urging parents to be aware of open doors and windows in their homes, and to look for other possible points of entry for loved-up reptiles. If you are unlucky enough to encounter a snake in your home, shut the snake in the room – with a towel blocking any gap under the door (gulp!) – and call a licensed snake catcher to dispose of the extremely terrifying critter. If you suspect your child has been bitten by a snake, call 000 immediately.